Father and son duo, Scott and Quinn Bahnsen invent the Taco Susan™ (http://www.tacosusan.com/) while enduring the typical messiness associated with Taco Night. With Mexican food being one of America’s favorite meals, the kitchen gadget was a hit almost instantly. The family decided to run with the idea, making it a full Taco & Burrito Dinner Kit complete with hard and soft tortilla holders, including taco plates and burrito folding plates, all designed to take the mess out of Taco Night and give the family more time to talk around the dinner table. 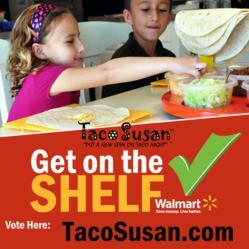 Not only a hit with the Bahnsen family, the Taco Susan is in the running for Wal-Mart’s “Get on the Shelf” Contest (http://getontheshelf.com/product/3777/Taco-Susan) and boy, do they need votes! The Taco Susan, a new and improved Lazy Susan on steroids, was invented for Quinn’s fifth grade Science Invention Project. Meant to be enjoyed among family & friends, this circular 18 inch Taco Susan has 7 ingredient holes originally meant for taco fixings, although, folks can use the Taco Susan for anything from ice-cream sundaes, parties, chips, dips, crafts, and so much more. With family dinners on the decline while obesity and diabetes rates rise, the Taco Susan brings promise to the things that really matter – bringing the Family Dinner back to life. As well as being a stand for family dinners, the Taco Susan also plans to contribute to Breast Cancer research, “My wife, Mary, has beat Breast Cancer, twice. I am forever grateful and will support Breast Cancer Research by contributing a portion of the Taco Susan sales” says Inventor Scott. Help put another American made product on Wal-Mart’s shelves and vote for the Taco Susan during Wal-Mart’s “Get on the Shelf Contest”, “It really means something personal to me and my family that we keep the Taco Susan an American Made product, especially now” says Scott. Scott has persistently continued to say “no way” to getting the Taco Susan manufactured anywhere other than in the U.S. Even before developing the new plastic and dishwasher safe model, Scott sought to find manufacturing and marketing here, in the United States to express his passion for the American made. 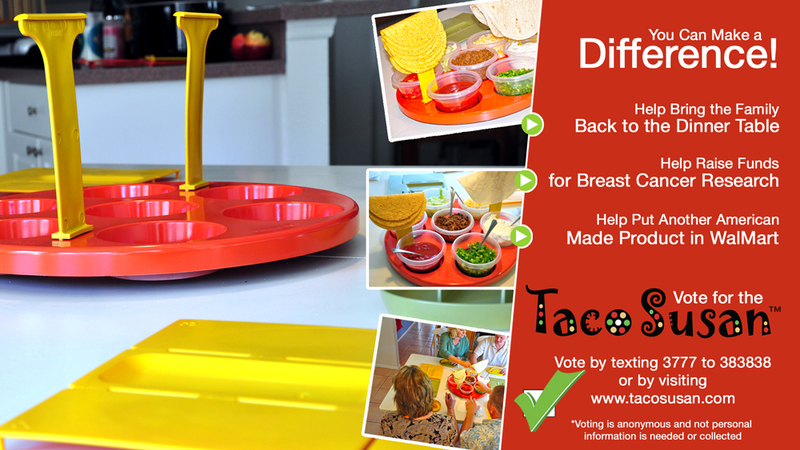 About the Taco Susan: The Taco Susan is a new innovative initiative to get the family back to the dinner table. Creators of the Taco Susan (http://www.tacosusan.com/) Scott and Quinn, hope to get the Taco Susan Dinner Kit launched with the help of Wal-Mart’s “Get on the Shelf Contest” (http://getontheshelf.com/product/3777/Taco-Susan). You can be a voter today by visiting the website or voting directly from the contest site. Receive regular updates by following them on Twitter (http://twitter.com/tacosusan) or fan them on Facebook (http://www.facebook.com/tacosusan). Remember you can help bring the family back to the dinner table for one of America’s favorite meals!